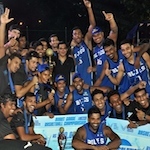 St. Joseph's College, Colombo 10 emerged champions at the Under 17 'A' Division All-Island Basketball Tournament at St. Sebastian's College Courts, Moratuwa. In a closely contested final, they beat St. Benedict's College, Kotahena by 58 to 50 after leading 22 to 19 at half time. Shehan Wasana Perera, captain of the Josephian team was named Player of the Tournament while Praneeth Udumalagala was the Best Defensive Player. On their way to the final, the Joes beat Royal College, Colombo by 69 to 25, Trinity College, Kandy by 76 to 58 and St. Joseph's College, Enderamulla by 90 to 41 in their preliminary round matches. In the quarter-finals, they beat Lyceum International School by 88 to 57. In the semis they beat St. Sebastian's College, Moratuwa by 96 to 59. The victorious Josephian team was coached by Roshan Randima with Shane Daniels as assistant coach.